Around this time every June, I start pondering what to get my wonderful dad for Father’s Day. Since I’ve discovered my love of Scotch whisky – a passion that me & my Dad share – more often than not, his present is in the form of a bottle of something different to try. If you’re looking for something special, in addition the vast range of bottlings available in the supermarkets and in specialist shops like The Whisky Exchange (where I’m sure they’ll also be very happy to offer some excellent advice, if you need a little inspiration), you might want to consider getting a gift pack. Today, I’m having a look at one from the Dufftown Distillery in Speyside. The pack contains a 70cl bottle of The Singleton Single Malt Whisky and two whisky glasses, all three of which look pretty impressive (I practically had to use two hands to hold one of the glasses). 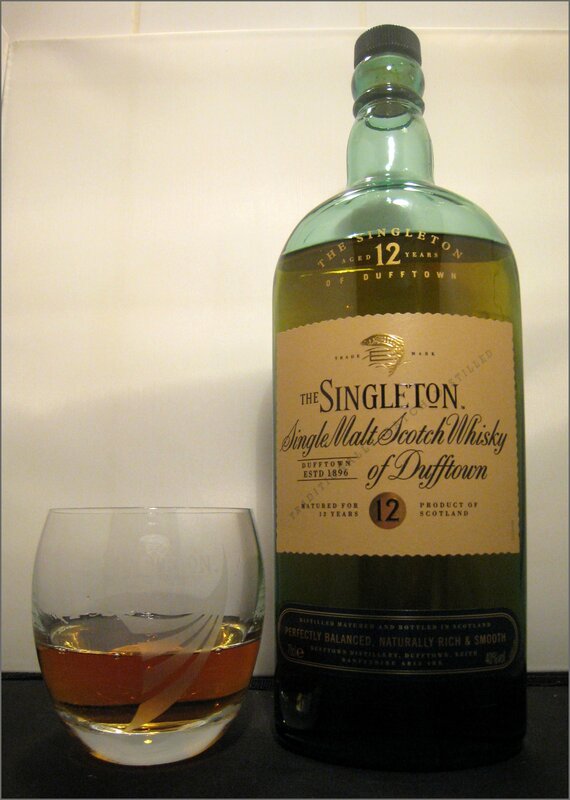 Singleton is distilled in at the Dufftown distillery in Speyside, well-known for its production of single malts; whisky has been produced at the distillery since 1896. As such, their methods are definitely ones that have been passed down through the ages, and include taking their time when both fermenting their barley and distilling their spirit. 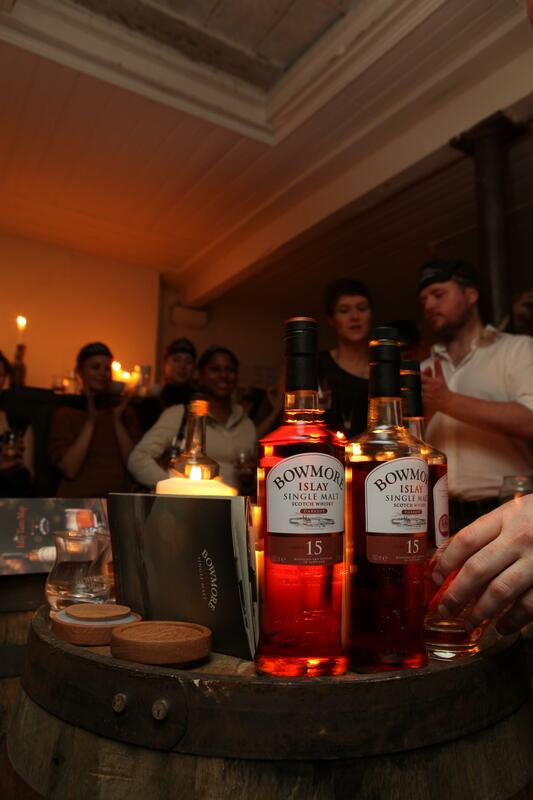 After distillation, the whisky is rested in a combination of American and European oak casks and left to mature. 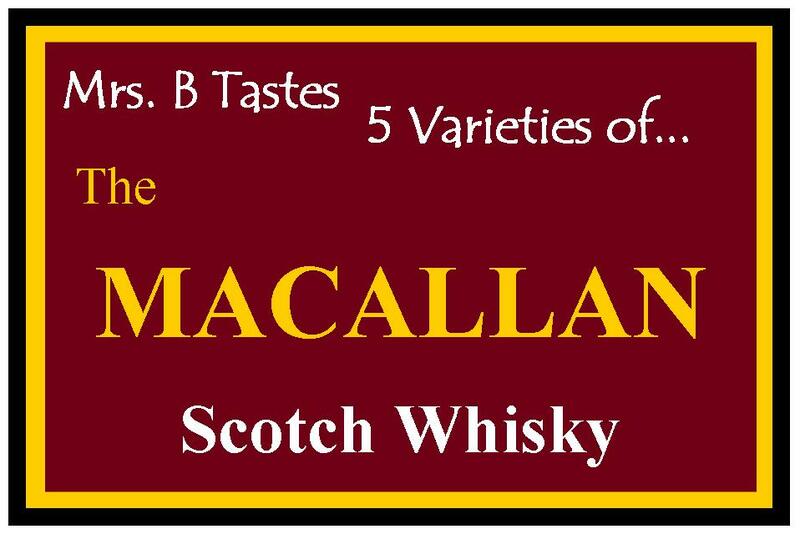 I found the American casks immediately evident on the smooth, sweet nose of rich, polished wood, followed by baked apple and caramel. I could just keeping smelling this nose for ages – there weren’t even the faintest hint of harsh alcohols. To taste, the whisky was surprisingly savoury, but with a smooth texture. It had lots of rich, woody notes that, nonetheless, had a light, sweet edge to them, making this a rather refreshing whisky. Despite this, the finish was good and warm, and touched with a hint of liquorice. After a while and a little warming up, more fruity elements emerged, like those from rich fruit cake, plus blackberry; but the flavour remained refreshing with a savoury, coffee-like edge. This was a wonderful whisky that I would definitely consider a good staple of my drinks cupboard; it has the perfect combination of warmth and freshness, and sweetness and more savoury notes. Most importantly, I know that my dad enjoys it, because we gave him a bottle last year and it’s all disappeared! This gift pack, then, comes highly recommended, all the more if the lucky recipient is fond of a good Speyside whisky. 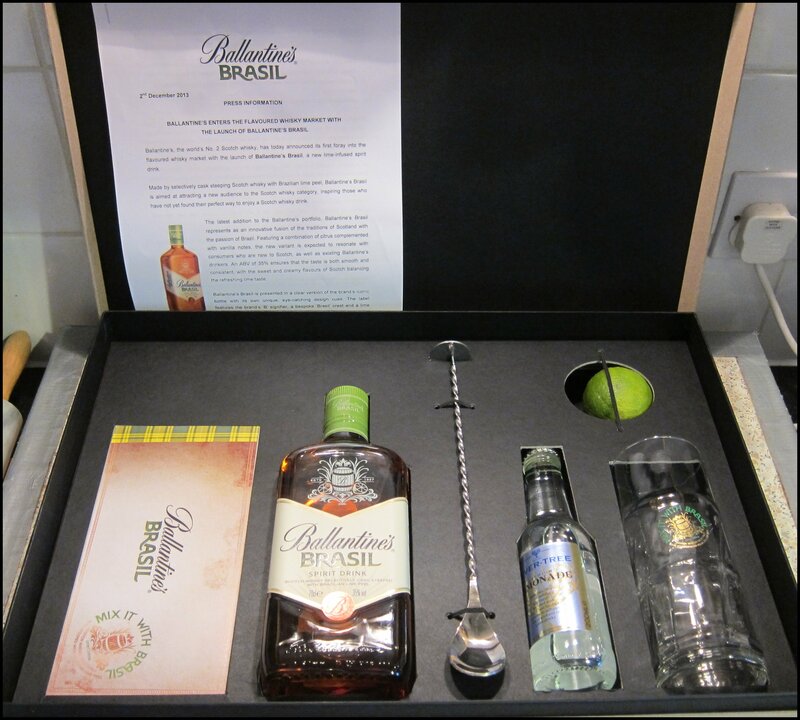 The Singleton 12yr Old with Glasses Gift Set is available online for around £39 for 70cl from Selfridges. The Johnnie Walker Red Tin Giftset is available from Waitrose priced at £15.50 for 70cl. 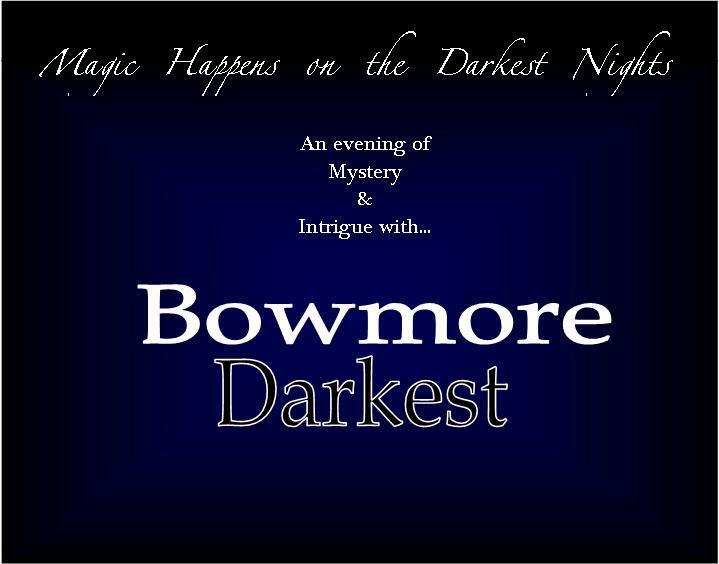 Last week, DBS & I had a rather surreal, but impressive experience featuring Bowmore Darkest 15 Year Old Whisky. 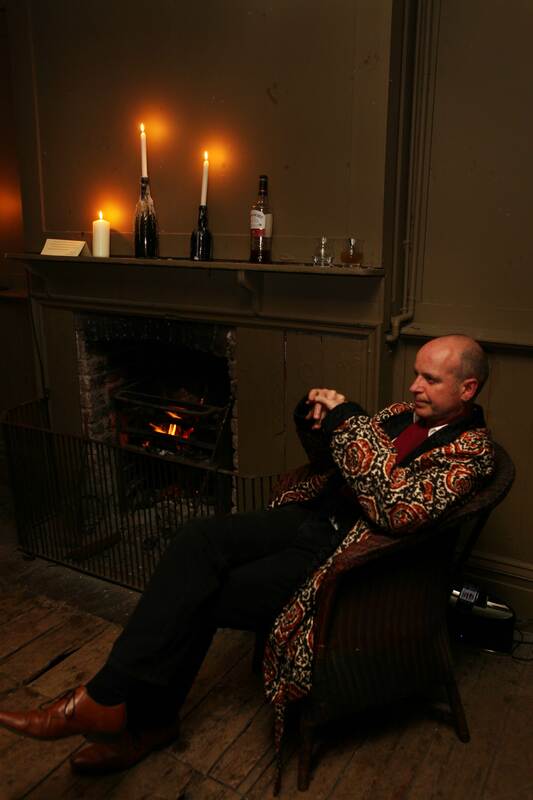 The “theatrical” evening was set in an atmospheric Victorian house in London, and started out in a dark, grey and very sparsely populated lounge (and when I say “sparsely populated”, I’m talking minimalist-Dickensian). As we crunched on canapes, sipped our whisky cocktails and mingled, conversation was naturally sparked by the candlelit mantlepiece, creaky floorboards and intriguing array of items being pinned to our collars (see below). 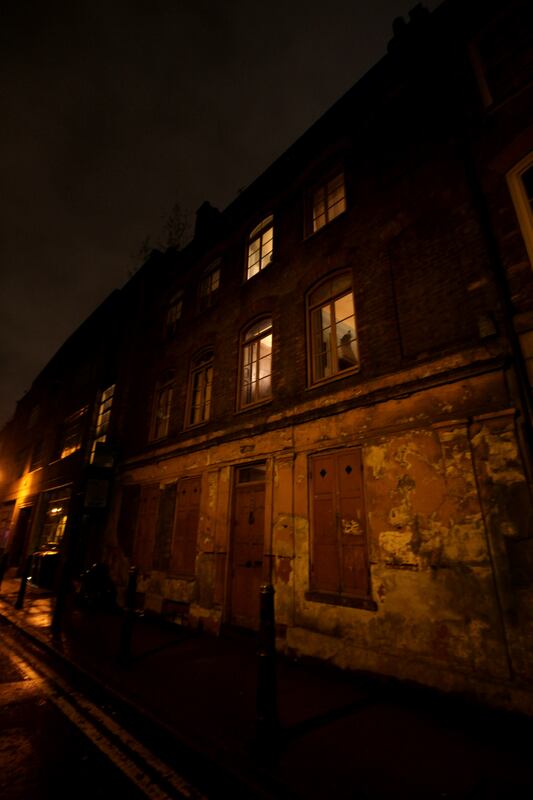 We quickly discovered that the shadow-filled house, filled as it was with an intense character of its own, was also full of a number of additional characters. 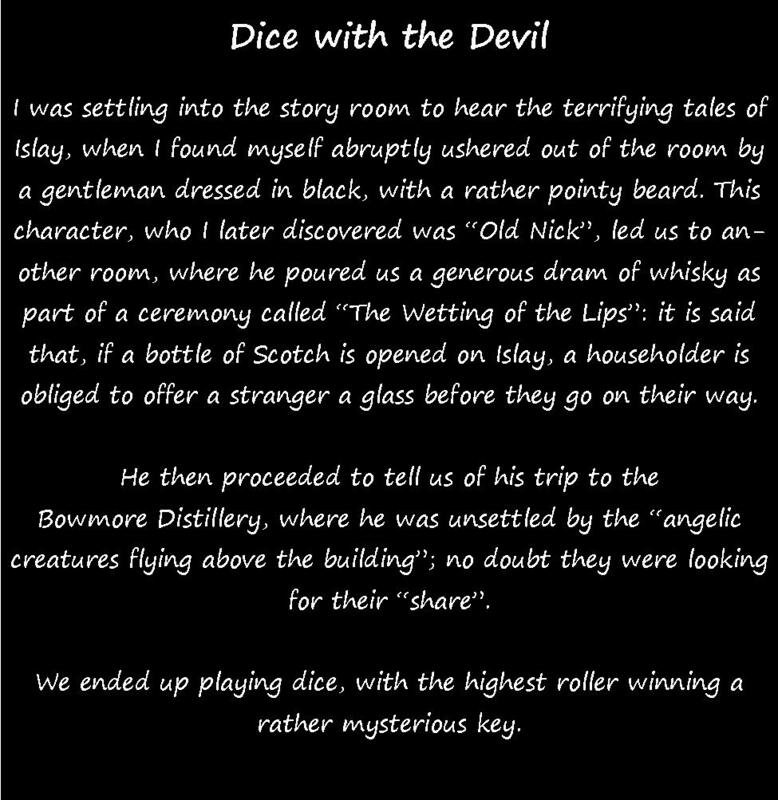 First of all, we were introduced to the owner of the house, who treated us to a little background on the story behind Bowmore. Before we knew it, DBS & I were divided – off on our own adventures for the evening, each set in a different room. As I made my way up the steep, uneven stairs, I lightly pondered on how much whisky I trusted myself to sip whilst knowing that I would still have to get myself back down them in one piece! Fortunately for me, the contents of the second room left no question about whether or not a sample was in order; one step into the room and the overwhelmingly rich scent of dark chocolate hit me. But, as amazing as that smell was, it was nothing compared to the exquisite drink being handed round in cute teacups: this was the best hot chocolate I have ever tasted in my life. On top of this, we were given a Bowmore Darkest bonbon – each, I’m told, containing a shot’s worth of whisky – to stir into it. I struggle to find the words to describe just how delicious this was; rich and creamy (in texture only, as it was dairy-free), but retaining that wonderfully intense cocoa flavour, the drink worked remarkably well with the whisky, which added a lovely, dark, fruity note, like raisins or fruit cake. 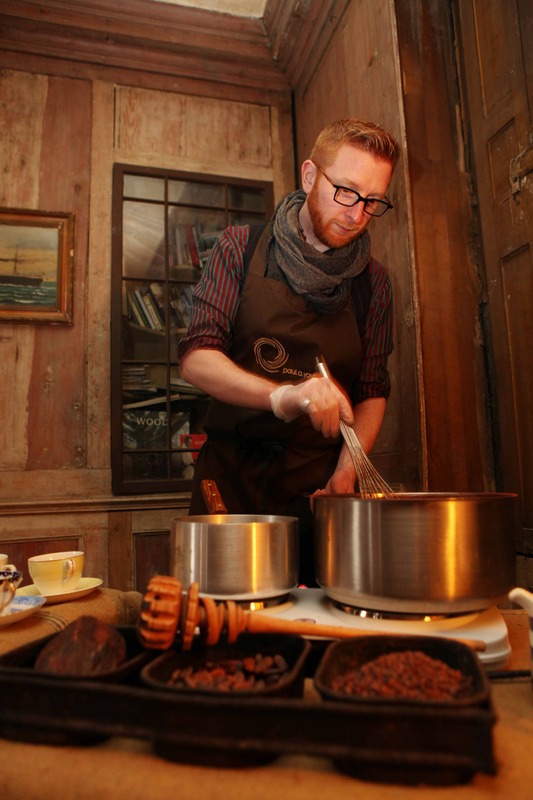 The wonderful creator of both the drink and the bonbons was chocolatier Paul Young, who taught us all about how best to enjoy whisky in our chocolate (the key being to add it cold, as part of a ganache, to avoid burning off the alcohol). He was also very patient whilst we all expressed, repeatedly, how good the hot chocolate was. I have no doubt that DBS & I will be making our way to one of his shops before too long to see what other wonders he’s created. Everyone in my group – somewhat reluctantly – then made our way to our third room, where we found “Mrs. 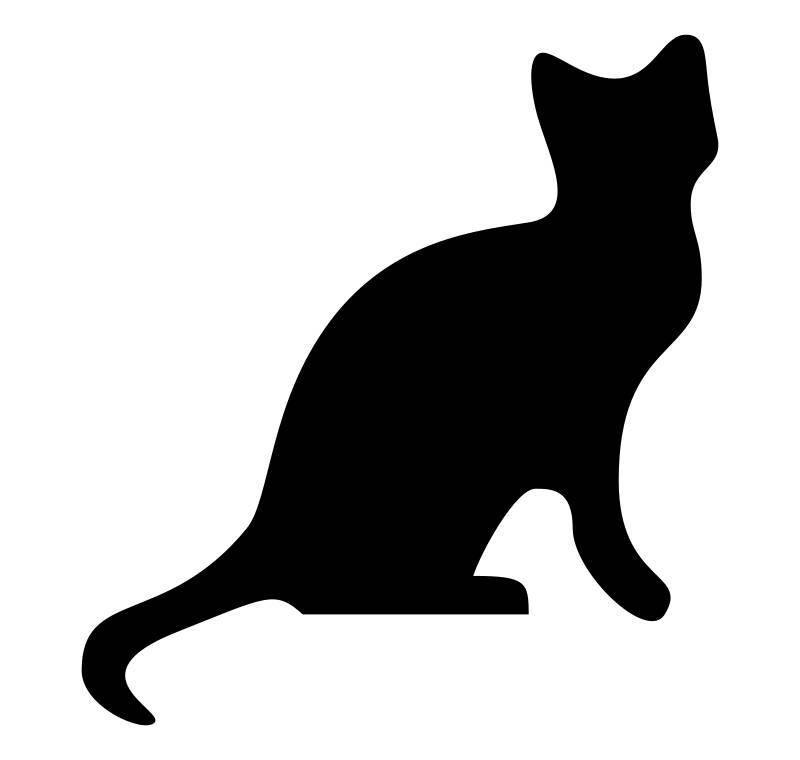 Fig”: a little old lady who sat in bed, talked about cats (specifically Smokey, the distillery cat), and collected keys on red ribbons, which had at some point been given to members of our group in previous rooms. I don’t recall exactly what the keys were all about, but the character of Mrs. Fig and Smokey the Cat definitely added to the surreal, Dickensian feel of the evening. This room was my favourite. When DBS first told me that this event was due to involve whisky, chocolate and a kind of planetarium experience, he knew that I’d be excited; three of my favourite things! This room was at the very top of the house, up some almost ladder-like stairs. Here, we were treated to an excellent and inspiring talk by Gary Fildes from the Kielder Observatory near the Scotland/England border. 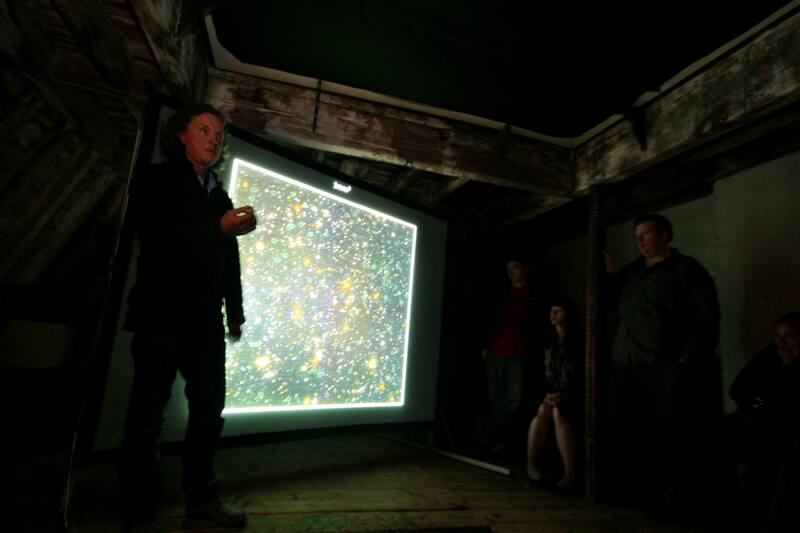 Gary talked enthusiastically about the observatory and astronomy, impressing us with some stunning photographs of the night sky that literally made everyone gasp as we sat, cross-legged, with a straightforward glass of Bowmore Darkest. Despite the fact that the naked eye can’t see as much as the Hubble Space Telescope, by the end of Gary’s talk, I have no doubt that a majority of his audience was longing for a night of stargazing with good friends and a bottle of whisky, even if they’d never considered it before! I somewhat reluctantly followed everyone away from the astronomy attic and down into the basement, where Bowmore’s Brand Ambassador, Gordon Dundas, took us through a tasting of the spirit of the evening: Bowmore Darkest 15 Year Old, along with some Bowmore 12 Year Old, for comparison. Needless to say, I was so wrapped up in the evening’s events that I forgot to take any detailed tasting notes, but the 12 Year Old immediately took me back to our Bowmore tasting on the coast back in January (this has some more in-depth tasting notes). 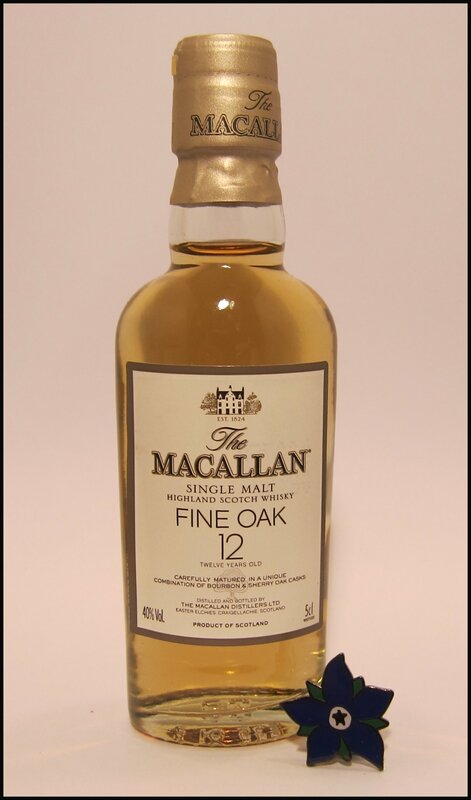 Smooth and with incredibly well-balanced flavours, the 12 Year Old contrasted with the richness of the evening, with its savoury wood notes and a hint of peat on the finish. 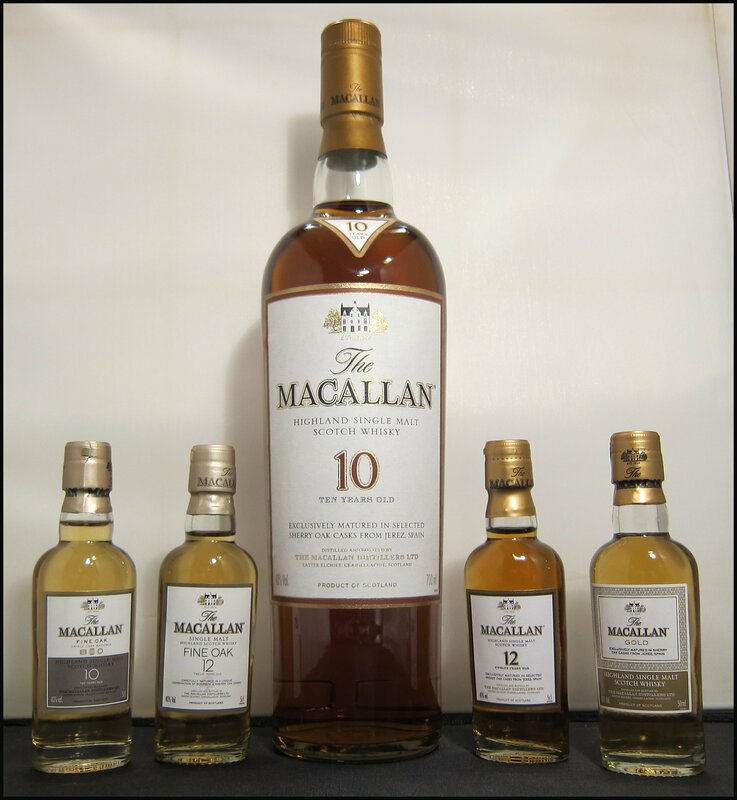 The 15 Year Old (Darkest) was much sweeter and heavier, with hints of raisins, almond and darker wood notes. The evening concluded with singing along to traditional tunes and enjoying a final glass of Bowmore. 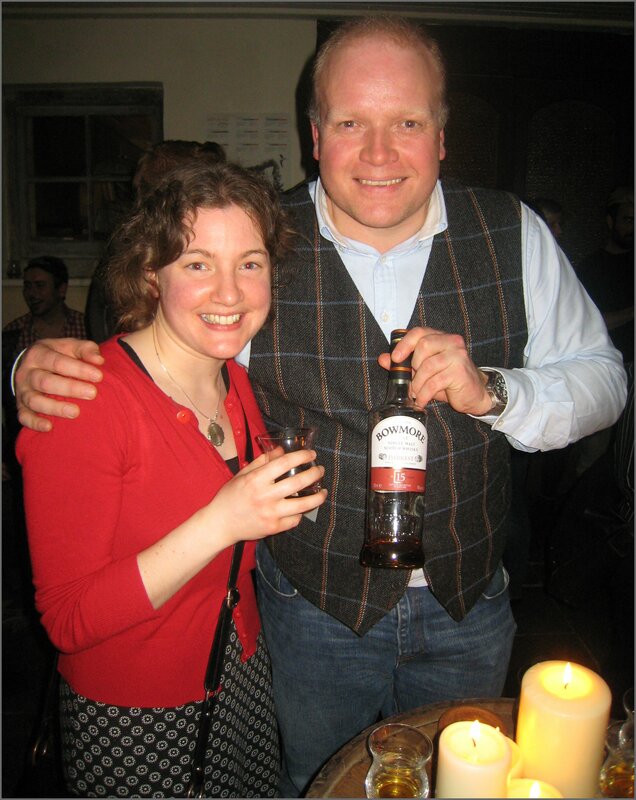 Although bizarre and very theatrical, I found that the event nonetheless managed to capture a very real and genuine enthusiasm for an excellent whisky. 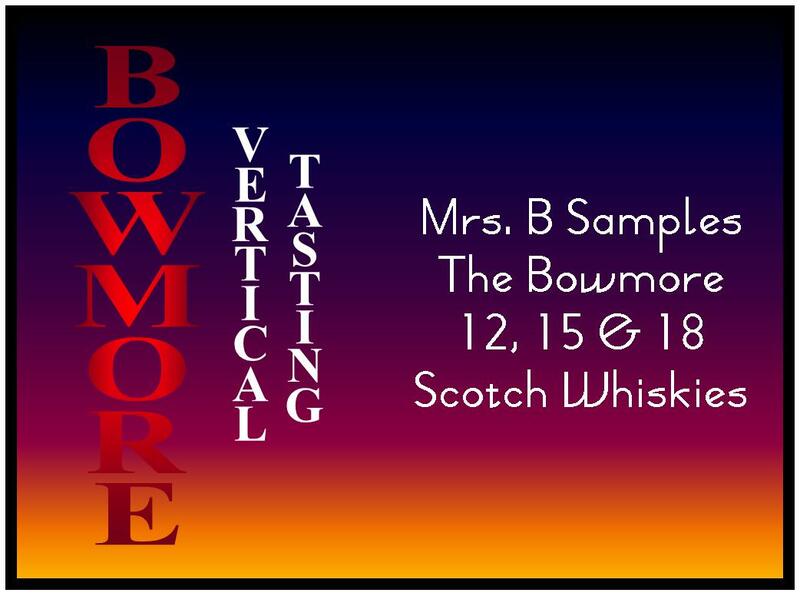 I highly recommend both the event (if they’re running any more, or anything similar) and Bowmore, for which my fondness has deepened even further. 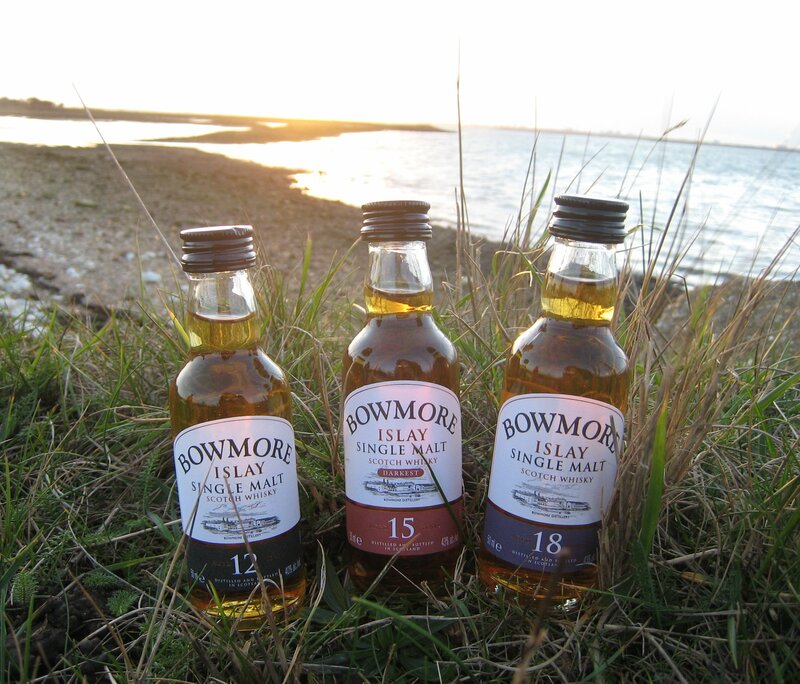 Bowmore is situated on the Isle of Islay and was established in 1779. Much of the barley for the Whisky is grown on the Isle of Islay but as supply is insufficient some barley has to be shipped in. ** Given the connection with Bowmore and the sea we decided to take a little walk down to a secluded coastal spot for the tasting. 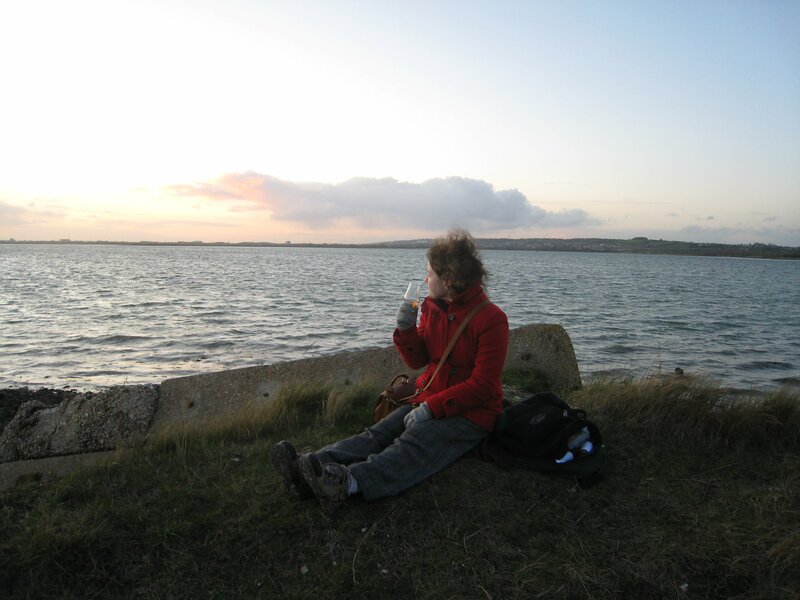 The nose was fresh and salty, matching the sea air. A slight sweetness came in at the end, but, otherwise, the nose was straightforward and revitalising. My initial response upon taking a sip was to say, “Ooh, lovely!” (diligently recorded in DBS’s tasting notes). A salty start, probably boosted by the salt on my lips from the sea breeze, was followed by a very smooth, progression from heavy, dark wood notes to lighter ones. The lightest hint of peat appeared on the finish. The comforting, mellow collection of raw, woody notes reminded me strongly of woodland walks during my childhood. The nose of the second whisky was a lot more prominent, in my opinion, although – again – there was lots of wood. On top of this, though, there were some more harsh, varnish-like notes. Tasting much stronger, the wood notes to this one also had a more substantial and lasting finish of toasted or burnt sugar that had a bitterness to it. I found it considerably less easy-to-drink; as such, it seemed more grown-up; the older brother of the 12 Year Old. Despite the strength, this was definitely better uncut; even a few drops of water seemed to unbalance it and make it watery. This nose was more like the first than the second, being lighter and fresher, without any notes of varnish. Indeed, there was a rather pleasant hint of burnt toffee. Like the nose, the taste of this one returns to the style of the first that we tried, only it had a softer mouth-feel, like soft water. Alongside the prominent wood notes were those of oatcakes, reminding DBS of Burns Night – drinking whisky with a plate of haggis, tatties and neeps – prompting him to describe it as “Scotland in a glass.”; a conclusion with which I thoroughly agree. Delicious, and easily my favourite of the three. 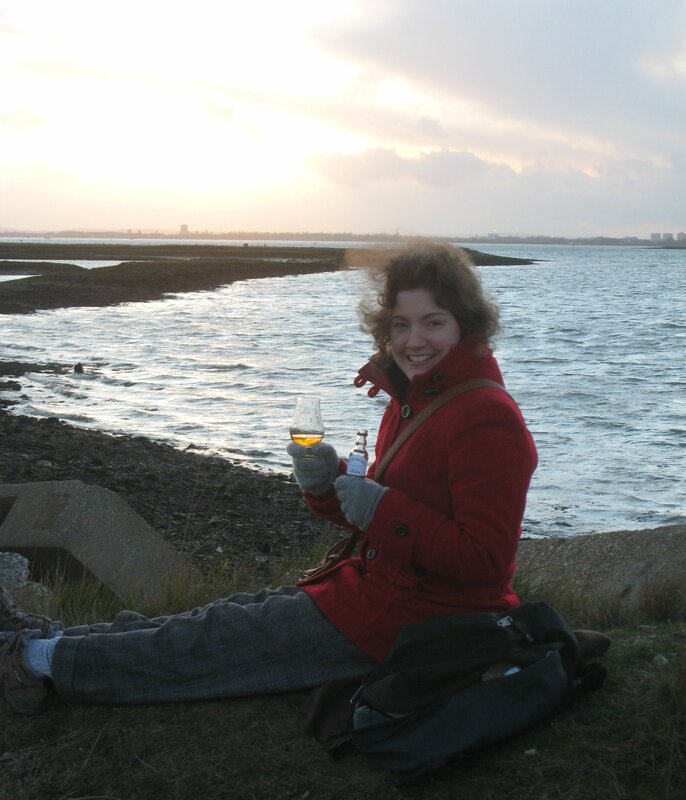 Although I’m sure some people would disagree with having a whisky tasting so exposed to the elements, no doubt stripping away any more delicate notes or flavours, I thought that our surroundings brought a lot more than they took from our tasting; especially as Bowmore is made by the sea. More than that, it reminded me why I really enjoy whisky; it was great to share and explore both a glass and good conversation whilst winding down, made all the easier by the fresh air. 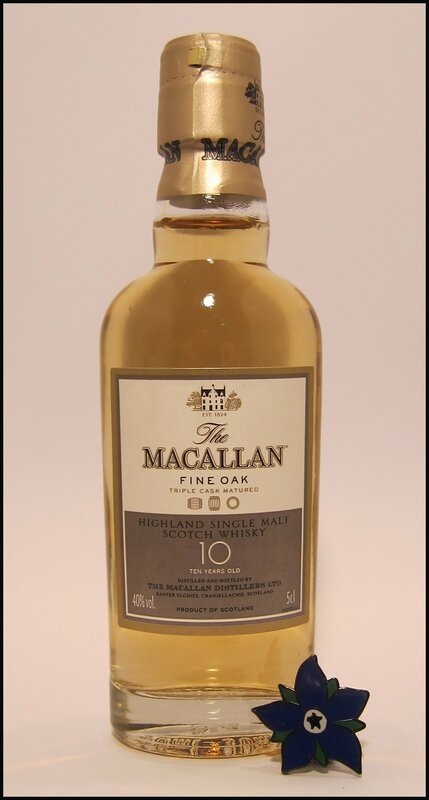 My favourite, when tasted outdoors, was – without a doubt – the 18 Year Old, with its fresh, but sweet nose, mellow softness, and warm wood and oatcake notes. It is the best whisky that I’ve tried in a good while and one that I look forward to revisiting in the comfort of a cosy armchair. *Also known as a vertical tasting. ** Interestingly the waste heat from the distillery is used to heat a public swmming pool in the MacTaggart Leisure centre. 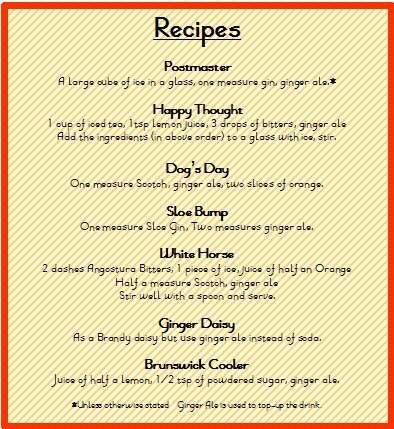 With the approach of the Ginger Ale Tasting at Graphic on the 17th January, I thought that I would look at some other drinks, beyond the Gin Bump (or Buck), that use ginger ale as an ingredient. Of course, the Horse’s Neck is one of these, but I will skip over this, as it will be the subject of another post. 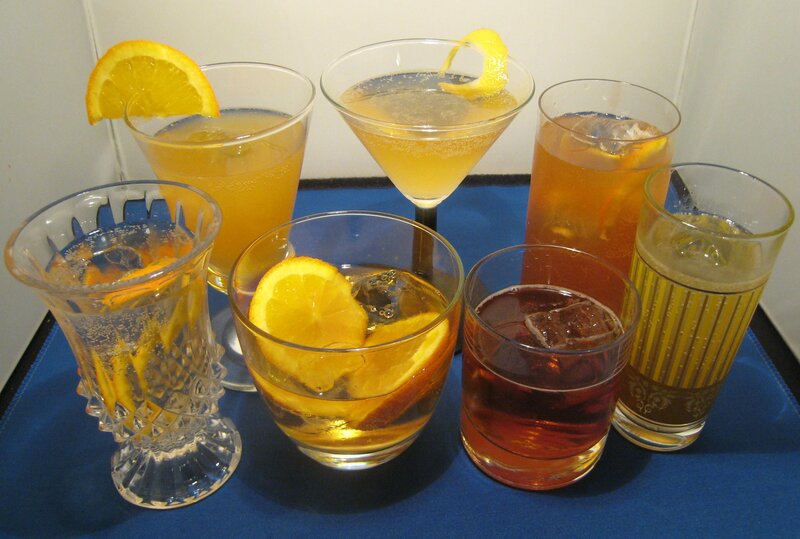 Clockwise from back left: White Horse,Ginger Daisy, Happy Thought, Brunswick Cooler, Sloe Gin Bump, Dog's Day, Postmaster. This cocktail is quite similar to a Gin Bump, although it less tart, without the citrus. For that reason, for me, it has a little edge on the Bump. I think it is important when making a Postmaster (or a Bump) to use a gin of moderate strength, around 42%, and one that isn’t too over-powering. A rather different non-alcoholic cocktail, this is a good take on an iced tea. We found the extra fizz from the ginger ale quite pleasant. Mrs. B got a lot of gingerbread flavours from this drink, found it quite yummy and thus it was her favourite. Rather reminiscent of a rum and soda to start, with a slight smokiness from the whisky on the finish. The orange adds a little spritz of freshness to the drink. The sloe gin that I used, a home-made variety, was deliberately dryer than most, so it was interesting how the ginger ale brought out the sweetness in the gin. But it was still quite tasty; typically, I prefer my sloe gin with ginger ale to tonic water, with my ultimate preference being bitter lemon. A very tasty cooler; the ginger, Scotch and orange blend well together. I found this most refreshing, although Mrs. B thought it could use a touch more flavour; perhaps another splash of bitters was in order? 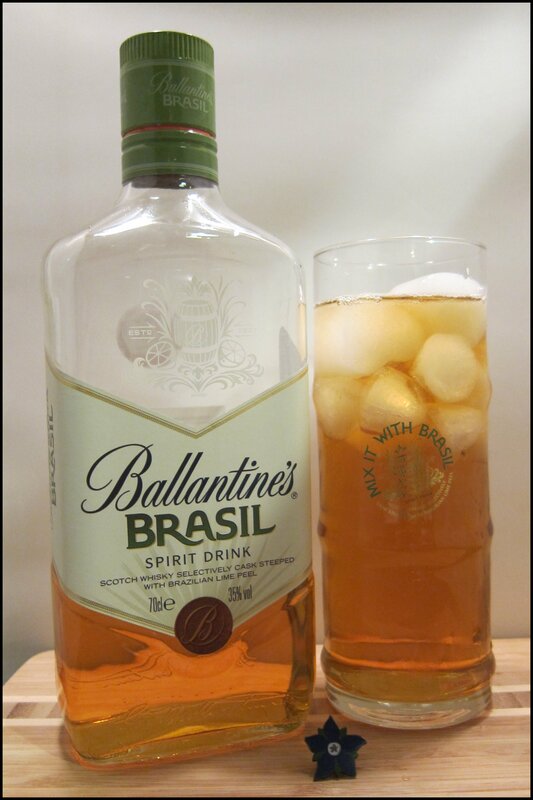 To be to the point, this tasted very much like a brandy and ginger ale, but took a good deal more effort to make. Given the minimal improvement to the flavours of the simpler version, I’m not convinced that this is worth the bother. I was also surprised at how little the gin came through. A lovely, simple cooler. This was so cooling that the cold went down my throat and chilled it like a good whisky warms it. Most unexpected; I have only ever had this twice before, both times with Martinis (and one was made using liquid nitrogen). It still eludes me as to what exactly caused it, but a great drink nonetheless. It seems clear that ginger ale is a particularly good ingredient in non-alcoholic cocktails, as it was included in some of the best I have ever tasted. 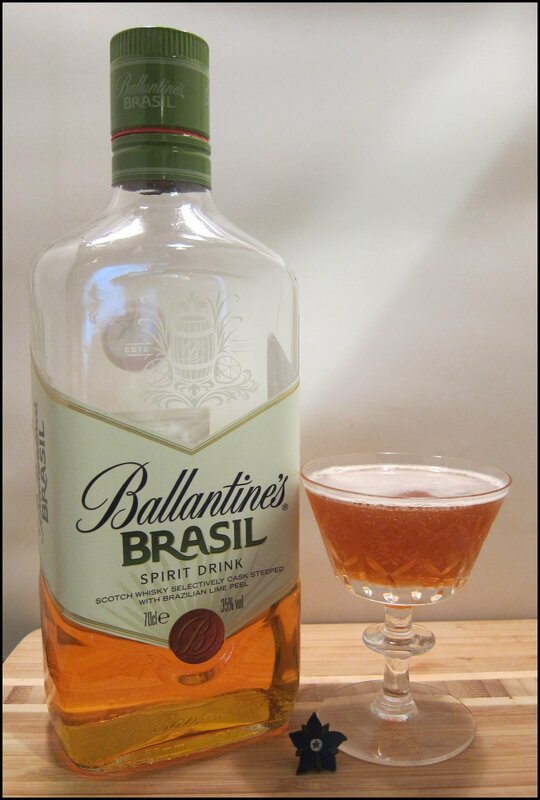 When mixed with alcohol, it seems that the simple cocktails are the better ones; good examples of this being the Postmaster, Dog’s Day and Sloe Bump.